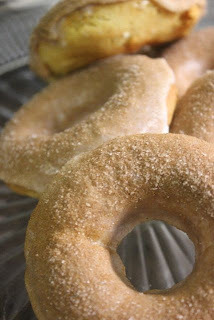 In a medium bowl, combine the 1/4 cup sugar and cinnamon. Set aside. Preheat your oven to 400 degrees. 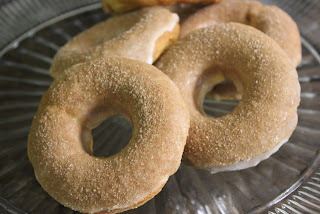 Lightly grease the wells of a donut pan with canola oil. In a large bowl, whisk the flour, baking powder, baking soda, xanthan, and salt. Make a well in the center and add the egg, buttermilk, canola oil, lemon juice, and agave. Fold together until evenly combined. Transfer the mixture to a pastry bag or a large ziplock bag with one corner snipped off. This is the best way to get the mixture into your donut pan, but you could also simply spoon it in if you like. Pipe the batter evenly into the donut pan. Bake for 8 minutes. Cool on a wire rack. 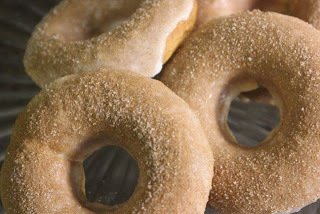 While the donuts are cooling, mix up some glaze. Combine the powdered sugar and water in a medium bowl until smooth. 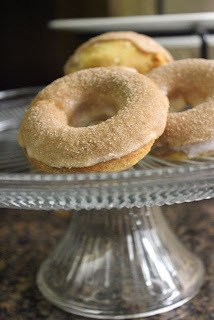 Dip the top of each donut into the glaze, allowing any excess to drip off. Then immediately dip into the cinnamon sugar mixture. Enjoy!! ... maybe with you favorite cup of coffee or tea for breakfast!